Small seed bead baby barrettes, beaded on white leather with a nickle plated barrette back. 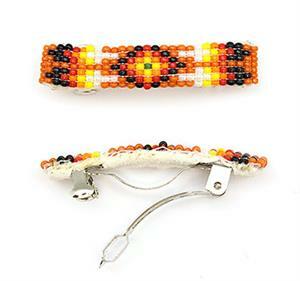 They come in pairs and measure approximately 1 3/4" long by 3/8" wide with a 1" long barrette clasp. Beaded by Navajo artisan Camille Damon. Colors and patterns will vary. A few in a basket design also.